Interested in learning how to network more effectively? Business conferences and other networking events often require a significant investment of time and money, but are you getting the maximum benefit in return? Is it really possible to build more relationships, grow your network, and easily maintain everything? Is it possible to get a positive ROI (return on investment) from every networking event you attend? And, is it possible to become more successful in all areas of life by attending networking events the right way? The answers are all "yes". If you're involved in multi-level marketing, making connections and networking is essential to your success. This book has three power-packed sections of actions you can take before, during and after each networking event to ensure your MLM success increases exponentially. The reality is, none of us were ever taught how to succeed at these events. No one sits you down to explain how it works, and you certainly don't learn this in any college course. This networking book is also a useful guide to networking for introverts because it shows you how to be confident and get out of your comfort zone. It includes best methods for how to start a conversation, how to follow-up with your network and more. Conference Crushing shows you EXACTLY how to maximize every networking event and every other gathering you attend. Don't waste your time and money any longer. Learn the secrets of networking and how to be someone that everyone wants to see succeed. "The richest people in the world build their networks while everyone else just looks for work. And with Conference Crushing, you'll get the best secrets to do it." Tyler grew up with more energy and passion than most people knew how to handle. As a kid, his vitality was contagious and he freely spread his energy and optimism. Tyler continuously found ways to push his limits as far as he could, and he refused to take the "normal path" and sit on the sidelines of his own life. When he was a sophomore at The University of South Carolina, he started his own painting business with Young Entrepreneurs Across America. The year after that, he took on the role of mentoring five students, teaching them how to run their own successful businesses. It became apparent that helping others and showing them a different way to be "successful" was his passion. Giving others the energy and happiness to create their own path was his yellow brick road. Tyler now speaks to and consults with students, businesses, and entrepreneurs across the country, teaching them the lessons he's learned on crushing conferences, expanding networks, and nurturing relationships. He also helped to create the #1 Career Guides and Creativity bookBreaking Out Of A Broken System. "As a self-help junkie, I've never come across a book geared exclusively towards conferences, so this new release really excited me. Not to be disappointed, Tyler's tips are practical, applicable and grounded in authenticity. He inspires you be the go-getter you must be to pull the value you crave out of your conference experience. His writing style is punchy and effective, short and sweet while his passion and genuine interest in helping is viral. You'll be a better professional after reading and digesting this book, as his advice easily crosses over from conference to the modern workplace. This is a networking must buy." "The richest people in the world build their networks, while everyone else just looks for work. And with Conference Crushing, you'll get the best secrets to do it." "This book is the KEY for networking. I used to be afraid of putting myself out there in interviews and making business connections, but now I am motivated and confident. 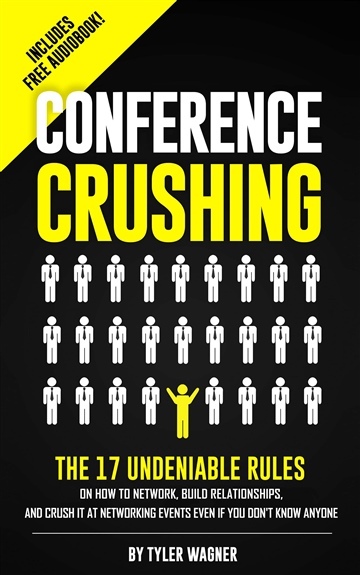 Thank you Conference Crushing!" "These 17 rules are awesome to follow and will definitely stick with me for the rest of my life! I don't attend conferences, but I can tell you that this book is inspiring and applies to any goal a person may have and gives you the means to be confident and motivated to achieve those goals."